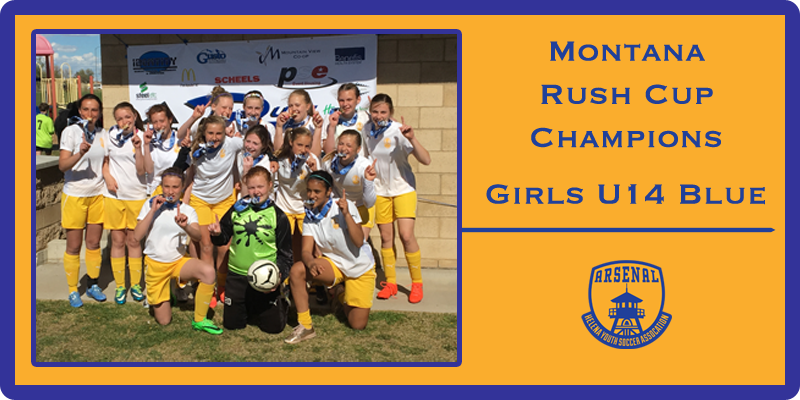 The U14 Arsenal Girls Blue team coached by Frank Cornwell and Keith Sayers, were the Champions at the 2017 Montana Rush Tournament in Great Falls this past weekend. Overall the team won all four matches played and gave up only one goal to a very competitive Canadian team from Calgary on the first day. The first match ended in a 6-0 win against Great Falls with a hat trick by Bailey Root and other goals by Sophie Palcisko, Taylor Cornwell and Jenna Rahn. Haiden Plummer and Rylee Cummings combined in goal to seal the clean sheet. The second match paired the girls against our Canadian friends to the north. Arsenal won 2-1. The girls came out firing with goals by Taylor Cornwell, (Assist- Marrin Champan) and Jenna Rahn, (Assist-Sophie Palcisko) in the first half. The second half had tremendous defensive efforts by Rylee Cummings, Rachael Van Blaircom, Meghan Rake and Sophie Palcisko with Haiden Plummer and her aggressive play and great decision making in goal to seal the win. Day two provided a great match with a different Great Falls team that we have had great matches with all season long. Arsenal came out with a tough 1-0 win with the lone goal coming from Baily Root, assisted by Keetyn Sayers. Haiden Plummber and Rylee Cummings once again combined for the shutout victory. In the Championship game, Arsenal played the team from Calgary and came away with the 1-0 victory to seal the tournament title. The winning goal came from an excellent corner kick by Rachel Plaster and controlled beautifully by Bailey Root to score. Haiden Plummer’s timely decision making and ability to find the open person while in goal guaranteed the shut out victory. The weekend success by this club was a total team effort which will play a big role in getting the team ready for the Montana State Cup in 2 weeks in Billings.